My Apothecary Chest: in 1994, it arrived via container to California from Hong Kong, where I discovered beading during an ex-pat assignment. Serves as the repository for my beads. Handcrafted. It has 52 Drawers, mostly sorted by color. I remember the first time I saw recycled beads: probably at the giant quarterly San Mateo Gem Show (still ongoing) in the late 90’s, and my eyes popped at recycled Coke bottles—remember that shade of green?—made in Indonesia. Due to my policy of never hesitating at the odd or the beautiful, I bought them. In those days, they were made in Indonesia, now Ghana seems to produce a lot of recycled beads. Pictured below are some of that original stash: pretty unsophisticated as quality beads go, but screaming Coke bottles! I also have some of the early blue ones made from old-style TV screens. Both colors are relics now. 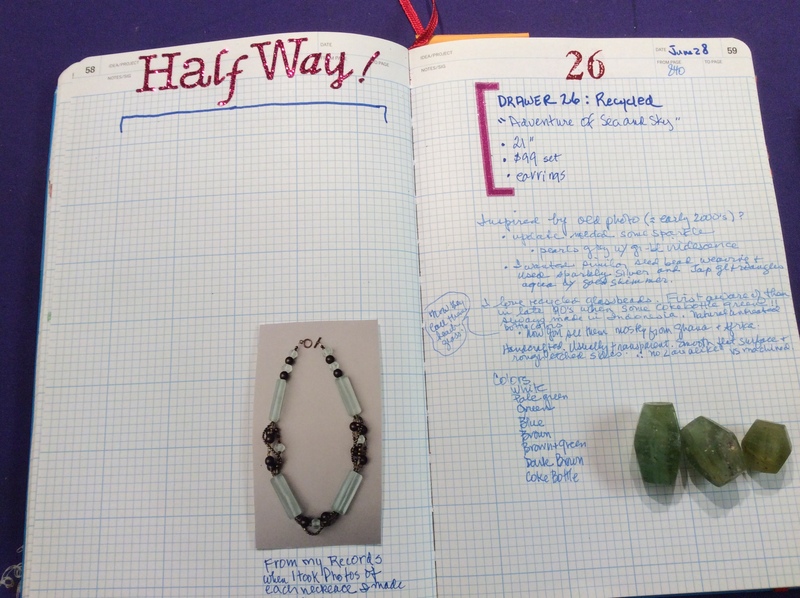 My journal notes as I string Drawer 26’s necklace. Also three of my Coke bottle recycled beads from my collection. Too bad they stopped making those green bottles! I favor the long rectangular bars, 2” x .5”, since they are the most contemporary and I found a photo of a necklace I made around 2000 and allowed myself to be inspired by it. Most recycled glass is transparent although there are opaque dark blues and browns in my collection. 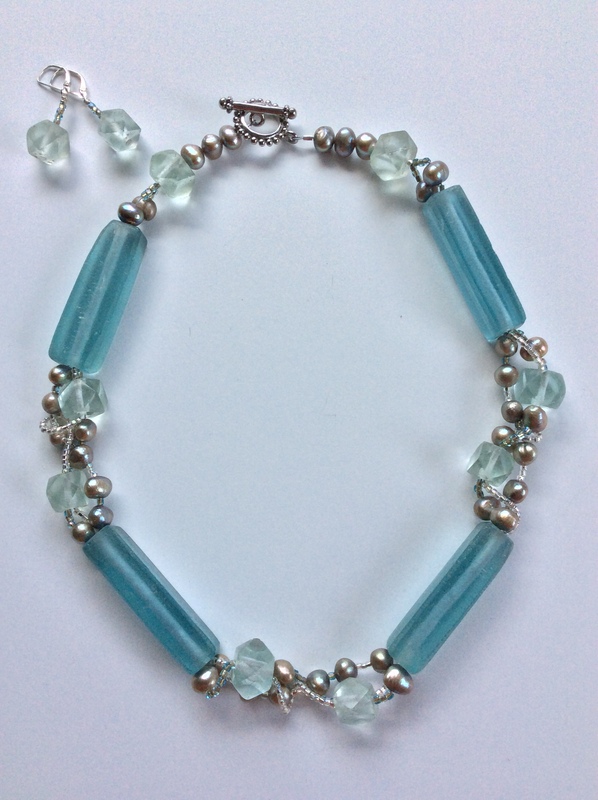 Here I have paired the transparent glacier color bars with diamond shaped beads featuring a smooth glassy top and rough etched edges. The Indonesian recycled beads are handmade, easy to verify since no two are quite alike. Instead of dark compliments as in my earlier version, I found a strand of grey freshwater pearls with subtle blue and green iridescence and made my decision. I used two different seed beads with similar iridescence (the colors are silver AB* and Japanese glass triangles with aqua outside and shimmering gold inside) and wove them through and around the diamond cut recycled glass as I did 17 years ago. This necklace is 21” long with earrings to coordinate. $99 for the set. *I learned something I wanted to pass on: AB is Aurora Borealis, a finish invented by the famous Swarovski company, and, in my world, they always connote crystals with an iridescent surface. Wow Priscilla, you’re really pushing my buttons! Love it, love it, love it…. Priscilla – I am enjoying your journey through your bead chest. I especially love the stories and history behind all those lovely beads and how they inspire you to make beautiful art. Thank you for allowing us to follow you through this year. Can’t wait to see what is next. Dear Sue and Jo Ellen/Hermosa Beach and Oxnard/both long term friends! Thank you for your wonderful comments. Not only did you make my day, it you brought back lots of pleasant memories of our times together! I am half-way thru this challenge and. Or the least bit tired of it! It’s inspiring to see you transform individual beads, gems. pearls…into vibrant necklaces! I look forward to this blog…it always has a surprise (like the artist)!